Krita is a free painting software that can be used by both professional and amateur artists. The open source painting and sketching platform provides an alternative to the more expensive software of this type, boasting of fast performance and extensive features. With its line up of tools and powerful capabilities, it has become a favorite program for illustrators, texture renderers, concept designers, visual effects creators and 2D/3D artists. It has found usage in the video game industry as well as filmmaking. Krita offers conventional as well as advanced painting techniques through creative tools that work with on desktop and graphic tablets. It has several tools for rendering, blending, color mixing, transforming, smoothing, layering, mirroring, and more. It is also capable of photo manipulation and working with HDR images. Built with more than 9 brush engines, Krita provides many types of brushes that artists can use depending on which ones they are most comfortable with. These brushes are designed to perform unique and special functions, and they are used to satisfy specific needs. Moreover, users will be able to create their own brushes and tag them through a unique tagging system. It is important that users should be, at least, familiar with the basic brushes in Krita, especially if it’s their first time to use the software. Some of the basic brushes used in Krita are the Ink Ballpen, Fill Brush Circle, and Fill Brush Block. There are also types of brushes that can be used specifically for painting; such as, the Bristles Wet, Bristles Texture, Basic Mix Soft Brush, and Airbrush Pressure. The Ink Ballpen is similar to a ballpoint pen, and it is the type of brush recommended for sketching or scribbling. Some artists prefer working with silhouettes as their starting point in creating a graphic art. Silhouettes are images of persons or any objects which are represented as solid shapes of a single color, typically black. Krita’s Fill Brush Circle and Fill Brush Block are the types of brushes designed for silhouettes, and they always have a hundred percent opacity. These brushes have pressure size characteristic; hence, they change in size depending on the amount of pressure applied to the graphic tablet. The creation of transition between colors or color smudging/blending can be done through the Bristles Wet brush; and, if users want to add a smooth texture, that is possible using the Bristles Texture brush. Meanwhile, blurring out edges is the function of the Basic Mix Soft Brush. This is because this brush has the ability to pick just a small amount of color. To add contrast to a drawing, users can use the Airbrush Pressure. The brushes in Krita promotes flexibility and enhances creativity. To help users organise their drawings, Krita is also offering a tool that allows them to manage layers. Through this functionality, they will be able to combine and group drawings. As an example, if they want the drawing in one layer to serve as the background for another drawing located in another layer, the layer management tools in the software are provided to merge the two drawings. Furthermore, if they want to remove some portions of a drawing, they will be able to do that using the layer visibility options. Krita, furthermore, offers support to users by providing educational and instructional materials that they can access over the Internet. Equipping them useful information, like tools usage, users are rest assured that will have an extensive training to be able to learn the basic and advance features of the program. These training materials are prepared by Krita Foundation itself, hence, users are able to access reliable and up-to-date information. 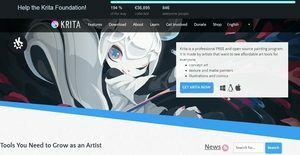 If you are interested in Krita it could also be a good idea to investigate other subcategories of Best Graphic Design Software gathered in our database of B2B software reviews. There are well-liked and widely used applications in each software category. But are they automatically the best fit for your company’s specific requirements? A trendy software product may have thousands of customers, but does it present what you require? For this reason, do not blindly spend on popular systems. Read at least a few Krita reviews and mull over the factors that you desire in the software such as the fees, main features, available integrations etc. Then, shortlist a few apps that fit your requirements. Check out the free trials of these platforms, read online comments, get explanations from the maker, and do your homework meticulously. This exhaustive research is certain to assist you find the best software solution for your firm’s special needs. How Much Does Krita Cost? Krita is a free and open source painting tool, and offers no enterprise pricing plans to consider. Sign in for their service, and you will be able to use it right away. We realize that when you make a decision to buy Graphic Design Software it’s important not only to see how experts evaluate it in their reviews, but also to find out if the real people and companies that buy it are actually satisfied with the product. That’s why we’ve created our behavior-based Customer Satisfaction Algorithm™ that gathers customer reviews, comments and Krita reviews across a wide range of social media sites. The data is then presented in an easy to digest form showing how many people had positive and negative experience with Krita. With that information at hand you should be equipped to make an informed buying decision that you won’t regret. What are Krita pricing details? What integrations are available for Krita? Krita supports integration with G’Mic or GREYC’s Magic for Image Computing, an opensource filter framework. If you need more information about Krita or you simply have a question let us know what you need and we’ll forward your request directly to the vendor.